Daytona Beach, Fla. – Fans will likely remember Sunday’s Daytona 500 as “The Pothole Race.’’ But Jamie McMurray and car owner Chip Ganassi won’t be thinking about holes in the track when they reflect on the big day. “Jamie showed me a text from (2009 winner) Matt Kenseth where he said, `You’re not going to want this day to end.’ I agree. I don’t want this day to end,’’ said Ganasssi, who joined Roger Penske as the only team owners with victories in both the Daytona 500 and the Indianapolis 500. This was a particularly big event for Ganassi, whose open-wheel and sports car teams have piled up three Indy 500s, three Daytona 24-hour wins and a handful of series championships while his NASCAR team has been mostly middle of the pack. There have been the occasional victories since he partnered with longtime stock car owner Felix Sabates to form Chip Ganassi Racing with Felix Sabates in 2001. 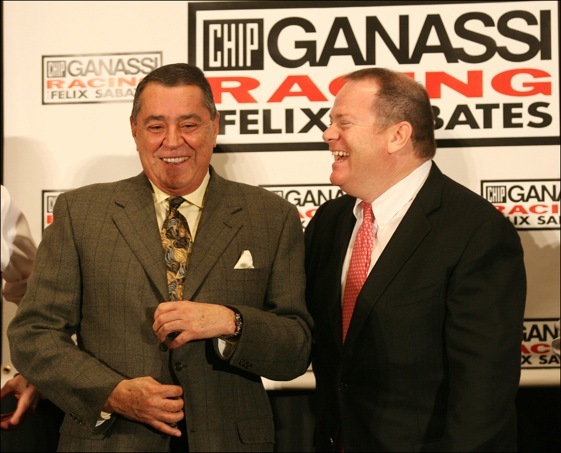 Then, late in 2008, with many teams struggling in the failing economy, Ganassi and Sabates joined with Teresa Earnhardt to form Earnhardt Ganassi Racing. This was the new team’s first win. McMurray also gave Ganassi the first of his six previous stock car victories in 2002 when he joined the team, filling in for injured Sterling Marlin and winning in his second race. He stuck around for three more years before moving to Roush Fenway Racing. When McMurray left at the end of 2005, the Ganassi team was struggling to be competitive with the top teams. Now, he’s back, joining teammate Juan Pablo Montoya, who gave the improving team its first berth in the Chase for the NASCAR Sprint Cup championship last fall and finished 10th on Sunday after leading the race several times. McMurray became the odd-man-out at Roush when the team was forced by NASCAR to cut back from five cars to four at the end of last season. That’s when Ganassi, who needed a replacement for Martin Truex Jr., came calling. It was a fine solution for McMurray, too. “I wasn’t sure what was going to happen this year, where I’d be,’’ McMurray said Monday after helping Ganassi, crew chief Kevin “Bono’’ Manion and the entire crew of the No. 1 Chevrolet install the winning car into Daytona USA as an exhibit for the next year. “I loved driving for Chip and I’m happy to be back. We all talk about the fact that Chip is a racer. It’s incredible to see all the races he won. Now, both McMurray and Ganassi, whose only other victory since McMurray’s win in 2002 was by Montoya in the road race at Sonoma in 2007, are back in the winner’s circle and primed for more as the new season with great possibilities stretches before them. But a win in the Daytona 500 is more than just a good start to the season for Ganassi. “I look around at everybody and I wonder how did I get here,’’ he said Monday. “You have a flashback of your entire racing career and you look back and pull little pieces of it out all through your career, thinking about the possibility of something like this happening. You’re always shooting for that, trying for that. You just get very reflective about everything, about every sacrifice you made, every tough meeting I’ve had with a crew chief or a driver or even Felix. And Ganassi, whose team had to lay off 100 people and cut back from three to two cars in the middle of the 2008 season after losing sponsorship money, is proud of the fact that he has stayed the course and appears on the cusp of becoming one of the teams to beat in Cup week in and week out. “A lot of times people look at your team and they don’t understand the ups and down internally and what you’re dealing with,’’ he said. “We’ve had our ups and downs, but we’ve always stayed on plan how we want to operate the team. “We’ve always given the drivers equal equipment. We don’t have a No. 1 and a No. 2 car. We’ve put every effort into the cars and maybe we haven’t always been able to afford the giant contracts that were so popular a few years ago, (but) we’ve always stayed on plan on how we operate the team. Sabates, never one to withhold his opinion, likes the idea that the team has done more with less. “I have an opinion that I think it’s better that we don’t have a lot of money in terms of sponsorship,’’ the self-made millionaire from Cuba noted. “We’ve got to manage our resources smarter. It’s unfortunate that we had to lay off a lot of people (last year). But the ones that stayed behind, they have really stepped it up as far as their work. Time will tell if it can become a consistent major player in NASCAR, but Earnhardt Ganassi Racing has put one big checkmark on its resume.